Dreaming of Isla: Dogs, Cats and Kids...Oh My!! Angel, our dog, had a great weekend when her biggest cheerleader, Emmy, came to visit her for a night. Emmy is the daughter of our good friends from Iowa. When she was 18 months old she was in a terrible farm accident. Her arm had gone into the moving blade of a big barn fan and pretty much cut it off. She has since gone through many surgeries and is doing great! She always comes up to the Mayo Clinic for check ups and surgeries. Emmy met Angel when Angel was a puppy and they have been buddies ever since. 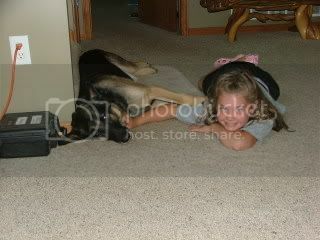 Emmy wrote her favorite show and tell story about Angel and our other German shepard Cleo, who has since passed away. She tells her mom that she would come and live with Brenda, but I think she really just wants to live with Angel. Then Hacker, our adopted stray cat, was in his own photo shoot. The little girl in the picture is our neighbor, Maria. Her mom was taking photos of the kids by the rocks in our yard and Hacker wanted to get in on the action. Little did I know he is such a cooperative photo prop. Great pictures! I know our dog loves it when my neice & nephew come to visit because they'll play with him more than us!